When Google first released the Pigeon algorithm in July 2014, it was clear that businesses had to have an overall strong Internet presence to rank high in map results. In August of 2015, Google narrowed map search results to three spots in hopes of having a more refined search for users. However, this increased panic among business owners to rank high with Google Pigeon. What we, as SEO experts, have learned is that Pigeon builds on the importance of maintaining a strong website as defined by Google Panda and Google Penguin and adds the component of location. However, as we have tested Pigeon on our own, we have found no stable combination of factors that lead to Google’s search results. It is important to remember that no one knows everything about the Google algorithms, not even Google employees. That is why we recommend that you enlist an SEO expert for help developing your website in a way that Google will reward with top search results. If you are interested in working with an SEO expert, don’t hesitate to contact our CEO, Jesse Wojdylo, at jwojdylo@gmail.com. This article will cover the basic factors of what we have found in websites that rank high in general Google Search, which contributes to the Pigeon algorithm. Then we will take a Look at factors that may only affect Google Pigeon, some of which businesses can control and some which businesses cannot. This list is comprised of general factors that affect a website’s SEO. While this list is not comprehensive, it does cover all of the factors that we believe to be the most powerful for Google search rankings. It is no secret that Google rewards companies that that put forth a constant effort to create content, also known as Google Caffeine. A high number of pages with quality, non-repetitive content is one of the most powerful factors to be ranked higher than competitors in the same industry. In almost every web search, a site with significantly more pages will rank higher every time. That being said, we do not recommend putting out increased amounts of content all of a sudden. Increased content must be natural or Google will penalize you in search results. 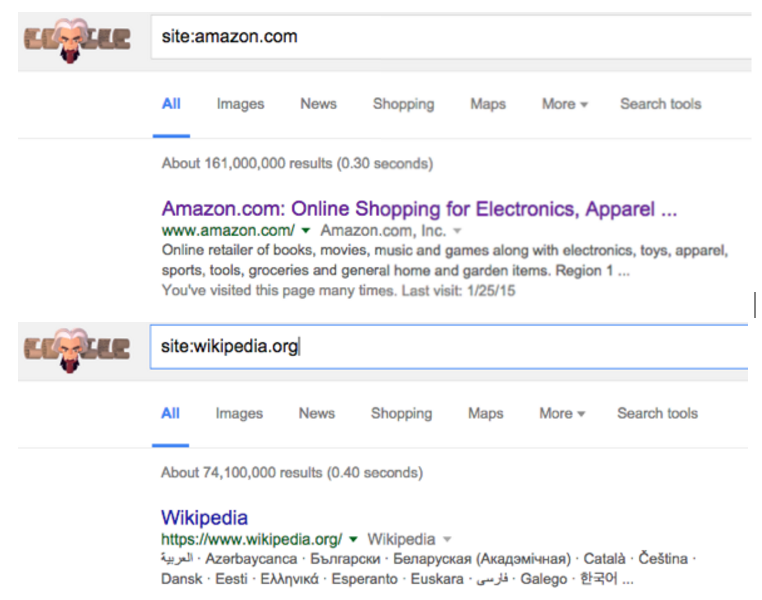 Two websites that dominate Google Caffeine are Amazon and Wikipedia. Here you can see that Amazon has 161,000,000 pages and Wikipedia has 74,100,000 pages on their website. Their high-content volume content allows them to be relevant for maximum search keywords and for the largest audience. Quality Content is another powerful factor in determining Google rankings. A large amount of content is great, but high quality content is even better. Be sure that the content on your website is relevant to your business, as Google will penalize you for over-optimization. In general, length of content also matters. Typically we see that websites with fewer long pages of content will out rank a website with a higher number of pages with less content (all other factors being considered). Another general rule of thumb: the newer the information the better. If you are the first person to post about an emerging topic, you will be rewarded, just as you will be rewarded for continuing to post new information about a subject. There are several different types of links that you should be aware of and include in your website to improve your SEO. External Backlinks are links on other websites that point back to you and are the most powerful type of links that affect SEO. This is because if other websites are linking to information on your website, Google sees you as more of an expert for the keyword you were linked to. This is especially true if a website with a higher PageRank links to you. However, you should not go looking for external backlinks (or paying for them), because Google will be able to tell if the link is irrelevant to your business. Internal links are links on your website that link to other articles or pages on your website or your other websites. Using yourself as a resource can improve your SEO and should be used to do so. Outbound External Links are links on your website that link to information on another website that is not your own. These links are mostly used when you have no authority on the topic that you are linking to. While there is a debate over whether or not this improves Google rankings, we believe that linking to other websites, especially those that are established experts in their field, makes you a more reliable source. While Internet mentions are not as powerful as links, once a brand is established on the web through links, Internet mentions build your credibility, especially when paired with keywords that your website ranks high for. Just link with links, who mentions you matters. Websites with more popularity and authority are going to affect your SEO with Internet mentions more than newer sites. The most effective way to build popularity and authority is to increase your brand recognition in real life and on the web. The older the business or website, typically the more authority a website will receive from Google, but not necessarily. You can also build your popularity with a high click-through rate. For example if your business was at the bottom of the Google search results for a certain set of keywords and searchers continued to scroll down and click on your site over other sites that appear higher in the search results, your business would move up in the rankings. PageRank is an algorithm that Google uses to rank websites on a scale from 1-10 based on importance. Simply put, the higher your PageRank, typically the higher your website will appear in Google Search. Unfortunately, Google took away the capability to check a site’s PageRank in October 2014 and the tools used to estimate PageRank that exist today are not entirely accurate. Reviews and Ratings follow a pretty logical pattern for the most part: the more reviews the better; the higher the rating the better. Encourage visitors to your business to write reviews about their visit, but make sure the reviews and amount of attention to your business is natural. Here you can see when I search “Car Dealerships,” on the map search, all of the top three map results have a 4.3/5 rating, but the dealership with significantly more reviews appears as the first result. In general, older websites have more authority and rank higher if they are continuously putting out content. This is because older websites have more time to acquire backlinks, create more pages, a larger amount of content, etc. It is true that younger websites take more time to acquire a significant web presence, unless your company already has branded itself well to the public before the website is launched. As simple as it may seem, videos do affect your SEO. This is because once a viewer clicks on your video, that viewer has the potential to stay on your page for a longer amount of time, and Google sees that. YouTube videos are recommended, because they are a more reliable source, which Google and the viewer will recognize. The rule always stands: The greater your web presence, the better. Organizations are a big part of this web presence. If you have profiles on Facebook, LinkedIn, Instagram, Reddit, a personal blog, the Chamber of Commerce or another government website, the more people have the opportunity to get to your page through links and the more internet recognition you gain. You do not necessarily need a presence on all of the organizations listed and there are more out there, just make sure that your profiles and pages make sense for your business. For instance, it would make more sense for a freelance photographer to have a strong Instagram presence than a personal injury lawyer. 1) Is my website useful? 2) Is my website easy to use? 3) Is my website easy to start using? 4) Is my website fun and engaging? The reason user experience is important, is because if users enjoy visiting your website, they are more likely to return and recommend it to others looking for the same service. Your desktop and mobile user experience ratings can be checked with Google PageSpeed Insights. The design of your website should make sense for your business and professional when compared to websites that offer the same business. An unprofessional and hard-to-use website will always have users leaving your page even if you happened to rank high in search. The ultimate goal of doing all of the above is to rank high in search for the keywords that users would search to get to your website. The more content you produce for a longer period of time will allow you to rank high in search for common keywords. If you are the only website to write about a topic, with one article you could rank as number one in search. Ranking high in the keywords that are relevant for your business should emphasize the importance of a wide range of content on your website. As previously stated, the Google Pigeon algorithm builds on other aspects of the Hummingbird algorithm that are listed above. However, ranking as one of the top three search results on the map is arguably better than ranking high in regular Google search and there are some differences to the Pigeon algorithm that does not matter as much in regular Google search. As a word of caution, the factors that may influence Google map results do not seem as consistent as factors that affect regular results, which you may find with your own testing. The location of your business matters to Google and to mobile and desktop users. You might assume that the closer your business is to the user, the more relevant it would be to their search, but this is not true in every case. While the benefit of being close to a geocentric center was assumed to have disappeared with the latest Pigeon update in July 2014, we still believe that real estate closer to the geocentric center of a town or city may benefit business owners in Google search. In addition to this, depending on the IP Address of the user’s device and their registered location, their search results may differ without town and city keywords included in their search. 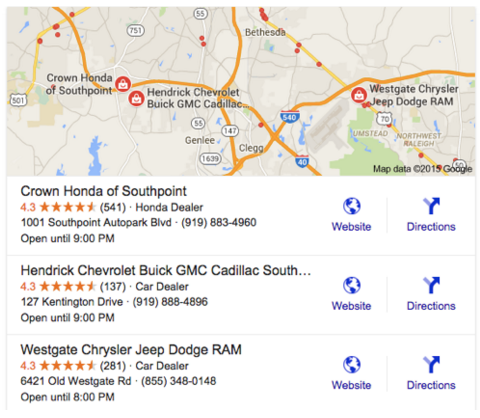 Unfortunately, reviews and ratings do not matter as much as they should in Google map results. There is no consistency in whether higher rated businesses rank higher than others in map results; however, users do tend to pay attention to reviews regardless of whether Google does. This is a potential change to the Pigeon algorithm that could come in the future. Changing your business location is sure to affect your ranking with the Pigeon algorithm. While this may seem obvious for major business moves, this may also be true for business moving from the outside of the city to the main strip of downtown or vice versa. We hypothesize that Google registers this change as an effort to become more relevant and rewards you for that. However, you need to make sure to let Google know you are moving locations ahead of time with your new business address. Internet users use a multitude of keywords to search for businesses, which is why you should continue to produce content with the keywords that you want to rank high for. However, the focus of a user’s search is not something you can control. This is still important, because very focused searches have the potential to produce a single map result – known as the Google Knowledge Box. If you can find a way to appear in the knowledge box for keywords that are important to your business and stay there, you probably have the Google Pigeon algorithm down to a science. Google algorithms are always changing. At any given time, Google may change the Pigeon algorithm and your business could drop or rise in search rankings, which is why you should hire an SEO Expert if you are serious about your web presence. If you would like more information about anything discussed in this article or would like to consult with a team of experts about how SEO could help your business, please contact the Jesse Wojdylo, the CEO of Wojdylo Social Media, at jwojdylo@gmail.com. New York Snapchat Christmas Ornament Filter | Snapchat “Could Not Save Story. Please Try Again” – What’s Wrong?